Last week, Justice League presented a decidedly less-than-positive spin on Wonder Woman’s home of Themyscira. Sadly, this week just sort of makes things worse with this pair of episodes where a rogue Amazon seeks to eradicate all the men on Earth using some sort of magical allergen. The extreme nature of that goal calls into question the whole philosophy of the Amazons when it comes to the value of men. The episodes’ primary antagonist is Aresia (voiced with a surprisingly amount of stern command by Julie Bowen), a woman who is not an Amazon by birth but rather by adoption. As young girl, Aresia fled a worn-torn country, found herself on a refugee ship only to have that ship raided and then destroyed by pirates. Thanks to the goodwill and strong legs of the ship’s captain, he and Aresia washed up on Themyscira. The captain died upon reaching the beach, and Hippolyta buried him on the island and took Aerisa as one of her own, imbuing her with Amazon strength through magic. Unlike all of the other Amazons (save for Hippolyta), Aresia actually has first-hand experience in the horrors of man’s world. It’s filled with war, violence, and strife, and seems to care little for the innocent. 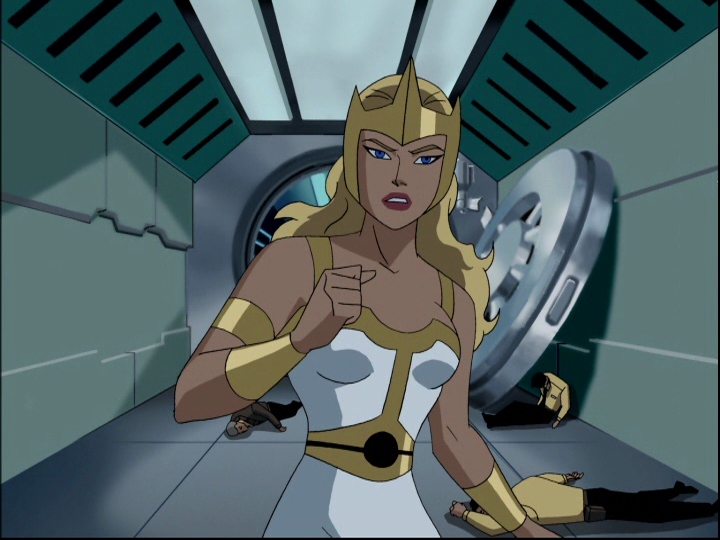 When you combine her past experiences with the philosophy of the Amazons (however amorphous that is on the show), her hatred of men and man’s world is perhaps more motivated and grounded than how the show depicted the rest of the Amazons’ militant isolationism (they attack Hawkgirl with nary a concern of her intentions, a surprising move). And Aresia’s fairly successful in her plan as well. 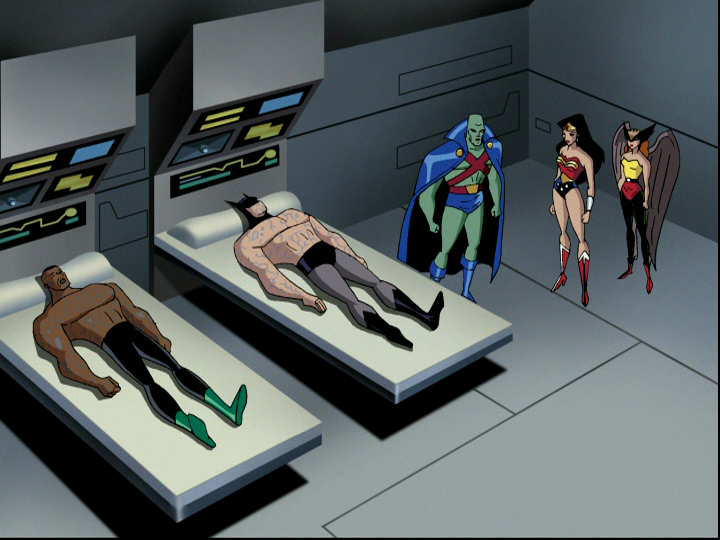 Using members of Lex Luthor’s Injustice Gang (minus Ultra Humanite and Cheetah, but with Tsukuri, who I assume is some sort of Katana expy) she manages to secure the necessary ingredients for her male allergen and it starts to incapacitate the male population of whatever city they’re operating in this episode, including all the male members of Justice League, even J’onn and Superman, despite the fact that they’re not human (hence the reason I think it’s a magical allergen). In any case, all the female emergency workers and firefighters take up the call to arms to save the city while Aresia plans to launch her allergen into the atmosphere. WONDER WOMAN: We don’t teach hatred. HAWKGIRL: Except when it’s men. WONDER WOMAN: They can’t possibly be that essential to your life. HAWKGIRL: Don’t knock it until you’ve tried it, Princess. So not only is Hawkgirl sort of slamming Wonder Woman for being a virgin (classy, show), but now all that Wonder Woman needs is a good lay to realize that men really aren’t all that bad. It’s not the best response to the Amazonian philosophy, and positions them as a horrible feminist stereotype even more, and with a decidedly patriarchal response to their philosophy. As a result, I end up hating both how the show presents the Amazons and the show’s response to their philosophy. There’s a glimmer of hope after all of this, but it still adds to the notion of the Amazons as just stringent man-haters. Hippolyta kept the ship’s captain’s sacrifice a secret from Aresia and the rest of the Amazons, and only tells this to the rampaging Aresia to explain why she shouldn’t destroy half of humanity. Why hadn’t she told anyone sooner? Because “I didn’t think it was important. I didn’t think he was important.” There’s a degree of contrition in this admission, and as the only man buried on Paradise Island (in an unmarked grave, of course), you’d think he would, in fact, be important. 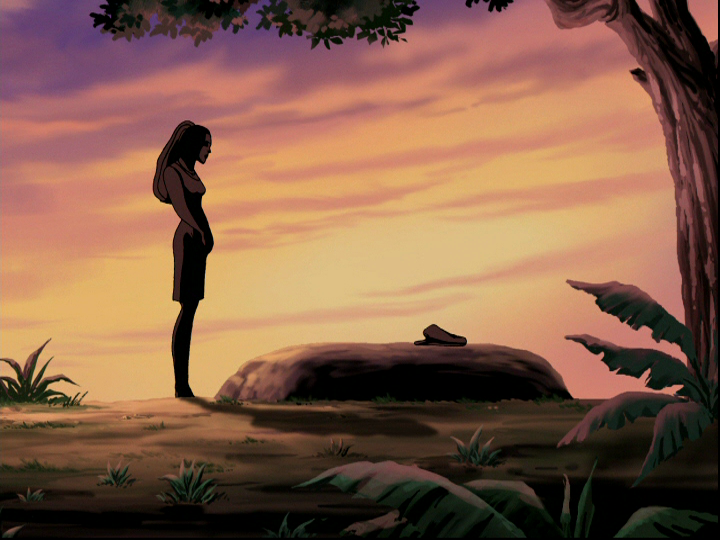 But hiding him, and his legitimately good deed in self-sacrifice, Hippolyta hides a contradiction to her entire civilization’s way of life, that men are not all bad. Even Wonder Woman doesn’t offer a perspective that her male teammates have proven that man’s world’s isn’t the dystopic patriarchal society Hippolyta has taught them. And that’s ultimately why I find “Fury” so very frustrating. Everything and everyone is painted with such a broad brush. The show sets up a strand of very militant feminism so that it can essentially just knock it down over the course of an hour, but fails to offer up an alternative philosophy, or a case that convinces the women that men could be allies in the struggle against patriarchy and misogyny. But it also fails to show how there’s an actual need to address those very things that Amazons are opposed to. It’s all just a ridiculous mess that doesn’t want to actually say something despite having a set up that would seem to imply otherwise. I love that Batman is able to take down almost the entire Injustice Gang on his own. But then I sort of hate when Batman pushes Wonder Woman out of the way of the incoming bus. She’s practically indestructible. If anything, she should’ve pushed him out of the way. When Green Lantern succumbs to the allergen, he falls smack into Wonder Woman’s cleavage. Sigh. One thing that stands out about Aresia’s plan to me now is how it would affect transsexuals. I wouldn’t expect a show to address this, but maybe I should? Plots like this encourage seeing only gender binaries, and that’s simply not how it is.